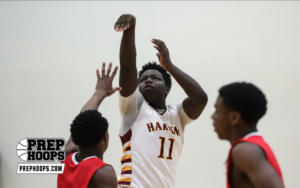 Shooter Jovan Christian averaged 19 PPG last year as a sophomore for a Harding team that went 7-18 and mostly struggled. Now, as a junior, he is averaging 19 again, but his team is sitting at a much-improved 6-4. Christian is trying to start a movement at Harding that will help grow school pride and game attendance. He notes that the young talent coming up at Harding will help boost spirit and win games. In the Trinity holiday tournament game that I saw, Jovan fired off six or seven threes. He truly has an ability to collect buckets from the perimeter. Jovan played club ball for TCs Finest this summer and is currently sitting as our 40th-ranked player in the 2019 NHR rankings.